No. 1 in student satisfaction: what makes Laurier stand out? Congratulations, Golden Hawks — you’re attending the top comprehensive university in Canada for student satisfaction! The annual Maclean’s Rankings of Canadian Universities has named Wilfrid Laurier University the No. 1 university for student satisfaction in the comprehensive category. Laurier also improved in five other key national rankings: overall reputation, best overall, highest quality, most innovative and leaders of tomorrow. We are a leading Canadian university with a strong commitment to teaching, research and scholarship combined with a strong student focus and a deep sense of community. You’ll find some information below on what sets Laurier apart in the area of high student satisfaction. As a Golden Hawk, Laurier is your home. This means you're part of a big community! Learn all about student life on campus, and all the ways you can be an engaged community member. Through registration and finances, you can find information on enrolment and registration, tuition and fees, scholarships and bursaries, financial aid and more. Are you curious about university policies and senior leadership at Laurier? Explore governance at Laurier. Academic support and advising is an important part of Laurier’s community and your experience at university. The Centre for Student Success supports and enhances your academic experiences. Its services include academic advising and assistance with learning, mathematics, study skills, and writing development. Most of these services are delivered in small groups and individual consultation settings and are designed to encourage the sharing of ideas and peer learning. 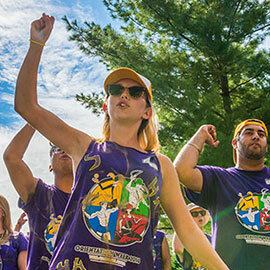 As a Laurier student, you are provided with a wide range of resources – from campus departments to peer groups – to promote and maintain good physical, mental and emotional wellbeing. Learn about mental health resources and general health and wellness services at Laurier. From student-run organizations to student papers to recreational intramurals, there are so many greats ways to get involved at Laurier! Learn about student organizations and all the fun activities offered through Athletics and Recreation. Whether you are in Lucy Marco Place in Brantford, Macdonald House in Waterloo or one of the other great residences at Laurier, living in residence is no doubt one of the most memorable and rewarding aspects of your university career. Laurier employs professional, support, and student staff to make sure you have the best experience possible. Learn more about the Department of Residence at Laurier. Laurier is committed to fostering a university culture where gendered and sexual violence is unacceptable and is not tolerated. Information and resources are available online that are helpful to you as a survivor, as a person supporting a survivor, or as a member of the Laurier community who is looking to better understand gendered and sexual violence and your roles and responsibilities.